Casa Valentin in Sayulita is the 4 bedroom main house on the Villa Valentin Estate, set in a beautiful jungle location just a 3-minute drive to the colourful town of Sayulita Enjoy the tranquil & peaceful luxurious property, most comfortable and relaxing family vacation venue, also ideal for group retreats and Weddings. The Villa Valentin Estate is surrounded by two acres of lush jungle and magnificent ocean views which makes this small resort the ideal spot to unwind, relax and enjoy. Or, rent all the entire estate exclusively with 8 Bedrooms here: Villa Valentin. 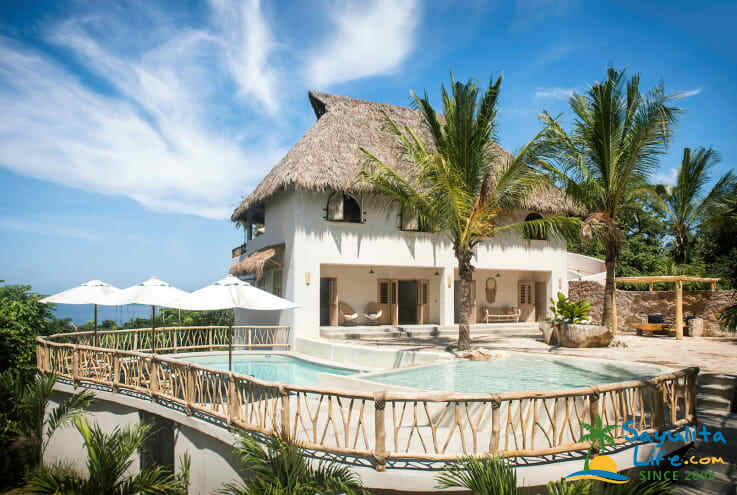 The luxurious 4 bedroom/4 bathroom main casa boasts a massive open plan living area with two lounges, large kitchen tiled with local hand made tiles contrasting with the Pulido mosaic stone and concrete floors which span the living area and terraza. 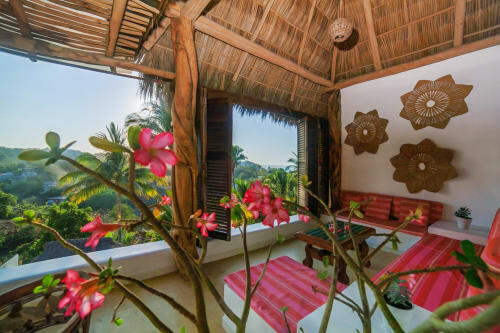 Stylishly designed and decorated all under an expansive soaring palapa roof. Large open plan kitchen area with plenty of space to relax. Equipped with an impressive native wood table that can seat a dinner for up to 16 guests with views of the jungle and Pacific Ocean. A light and airy double bedroom with a Queen bed opens out to the adjacent living area on the top floor. Beautiful LED uplighting is placed in both palapa's, along with garden lightning throughout the property which is perfect for your event or wedding. The downstairs area is divided into 3 large King bedrooms (including the master bedroom) all with their own bathroom, a separate spacious lounge with an additional small kitchenette and TV. Additional bunk beds are set up in one of the downstairs bedrooms for additional sleeping, great for kids or singles. Main doors opening onto the pool terrace offers ventilation and flows from the ocean view decks of each room. The amazing master suite has views to Monkey Mountain and an open air bathroom looking toward the ocean. Out of this world views! Casa Valentin and the entire property - the energy & the views were out of this world! My girlfriend had her wedding here & it was just magic the whole way through. We cannot wait to come back! Couldn't have imagined a better place for a large group of friends to celebrate their 30th birthdays in Mexico. The place itself was gorgeous and the staff was amazing. 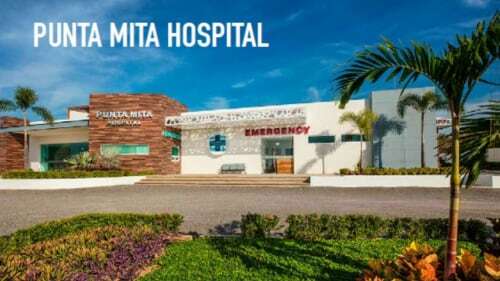 Amazing location with impeccable service! A large group of us listed Villa Valentin. The staff was wonderful and very helpful in making our stay flawless. The villa has views unlike any other location. The villa is well spaced and can fit a large number comfortably with plenty of bathrooms, lounging areas, and comfortable beds. 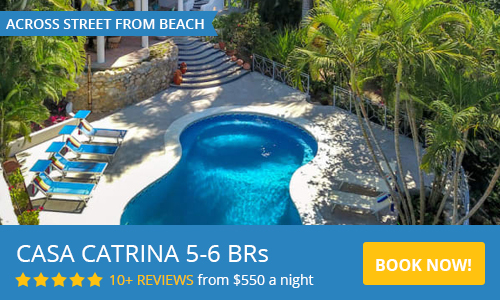 Stay all day by the pool and make custom cocktails at the bar or make the short 15 minutes trek downtown to see all the Sayulita has to offer. I would most definitely go back! Beautiful beyond measure.. I am now completely spoiled! This villa is absolutely beautiful. The views from the pool and balconies are absolutely breathtaking, and the house/decor is to die for. Walking through our welcome tour I just kept repeating "Oh my goodness!". The staff managing this house is absolutely top notch. Brenna was friendly, helped us with anything and everything we needed, as well as Pedro and Jose. The cleaning staff was extremely efficient, and we appreciated all of the hard work they put into making our stay the most wonderful experience. I cannot say enough great things about my experience at Villa Valentin.. absolutely hope to make it back one day! Our stay at Villa Valentin was beyond exceptional. The team who runs and managers the house continued to exceed our expectations and always went above and beyond to make our stay comfortable and smooth. The house was designed perfectly and beautifully. Plenty of room for every guest. We felt like we had endless amounts of space and areas to escape when needed. I highly recommend staying here and can't wait to go back! BEAUTIFUL accommodations. AMAZING Staff. Resort living, with private home feel. Villa Valentin was an absolute dream! It has everything that you need or could ever want - and we had 17 people total, so that's saying a lot. The accommodation and decorations in the main house and both Casitas's was absolutely incredible... you really had the feeling that you were at home, while at the same time on an exotic vacation. Brenna and her staff were also amazing .... "ninja's" as I called them. After our first night I was shocked to wake up and see the villa looking as if we hadn't even been there yet! You barely knew there were there, but were so very friendly and helpful when you did need something or have a question. Not only would I recommend staying here, but plan to come back as soon as possible. This place was even more beautiful in person than the pictures. Truely stunning casa + casitas decorated tastefully. Brenna and the entire staff were wonderful and accommodating. Thanks for an unforgettable experience!